Cause UK has received a Santander award of £10,000 to fund their work with the Veterans’ Artisan Bakery and product development. Cause UK was named as one of the winners of Santander’s Social Enterprise Development Awards (SEDA) which supports social enterprises and trading charities looking to grow their business and improve their local community. The annual award scheme has awarded 101 social ventures across the UK this year with funding of almost £1million. Cause UK fundraised to help establish the bakery in 2012, the bakery is a health and well-being project helping ex-military personnel gain new life skills and overcome mental health injuries. 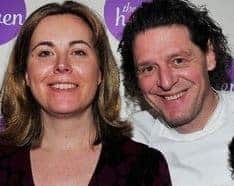 Clair who is a Director of the Veterans’ Artisan Bakery Community Interest Company elicited the support of celebrity chefs Marco Pierre White (pictured) and Rosemary Shrager to fundraise for the project and help throw the spotlight onto the plight of veterans suffering from homelessness, family breakdown, PTSD and addiction. Alongside the prize money, Cause UK will have access to a business support package from Santander which includes business webinars, funded internships and networking events to meet with other social entrepreneurs in the region. Cause UK specialises in supporting charities, social enterprise, the public sector and businesses who have a social mission. As the latest State of the Social Enterprise Survey Reports: ‘There are 70,000 social enterprises in the UK, contributing £24 billion to the economy and employing nearly a million people.’ A third of all SMEs are now social enterprises. Santander UK offers a wide range of personal and commercial financial products and services through its 1|2|3 products for retail customers and relationship banking for UK SMEs. The bank serves more than 14 million active customers with c. 20,000 employees and operates through 921 branches and 66 regional Corporate Business Centres. Santander’s Social Enterprise Development Awards were launched in 2011 and to date have supported 418 social ventures and awarded £6.1 million. The scheme is targeted at established social enterprises looking to grow their business and working for the direct benefit of their community via one or more ways; improving social inclusion; supporting disadvantaged people through training, skills and employment; creating a greener environment. Cause UK helps good causes to transform the world in which we live. Cause UK is a specialist fundraising, PR and marketing social enterprise which raises money and profile for good causes. Established in 2010 by Social Entrepreneur Clair Challenor-Chadwick, it has raised over £500,000 for good causes across the UK. The Veterans’ Artisan Bakery Community Interest Company is a therapeutic bakery based at Riverside housing, The Beacon project at Catterick Garrison. The Beacon is a 30-bed scheme supporting veterans who have been homeless or at risk of homelessness. See www.veteransbakery.com for more information.